These terrific photos show the world that yes, vinyl PVC privacy fencing does come in good old solid authentic wood grains. 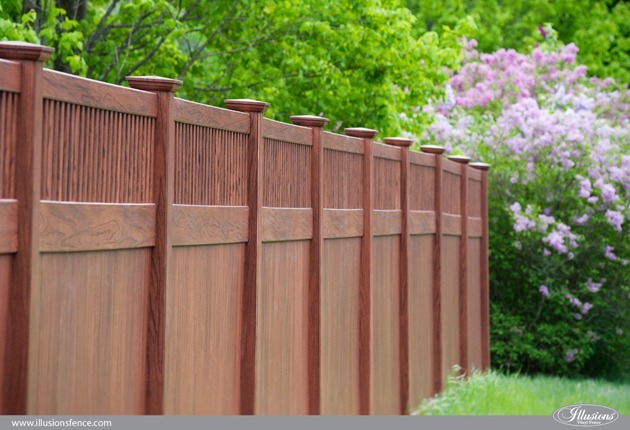 This is the Grand Illusions Color Spectrum Rosewood (W104) Tongue and Groove Privacy fencing panels with Classic Victorian Framed Top Pickets. 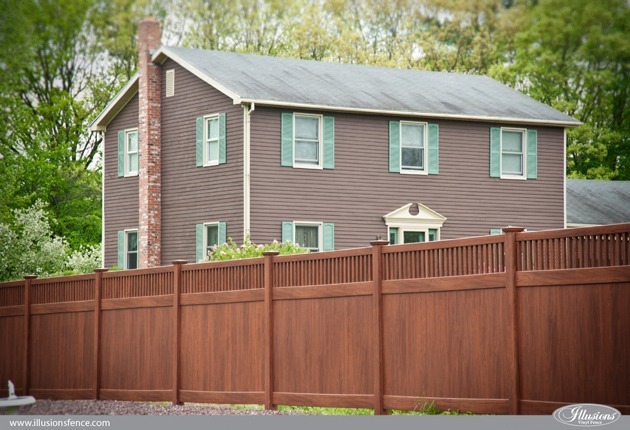 Rosewood Vinyl Privacy Fence = Awesome! Grand Illusions Vinyl WoodBond fence is taking the industry by storm. 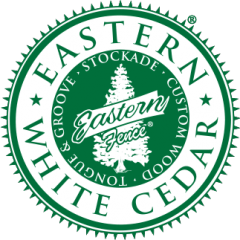 The Rosewood (W104) is fast becoming one of the most popular Illusions colors. A earthy reddish brown defines this signature grain. Check out the Illusions Fence Designer App to try out a few of your own Vinyl WoodBond color options. Want a cool backyard home decor idea? Sometimes fence jumps out, sometimes it blends in. Grand Illusions Vinyl WoodBond Rosewood (W104) is the perfect subtle background color. 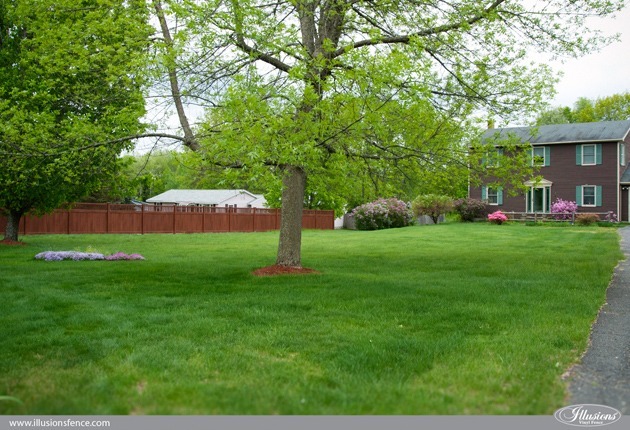 When you want to look out at your yard and see the green grass and not the white fence. 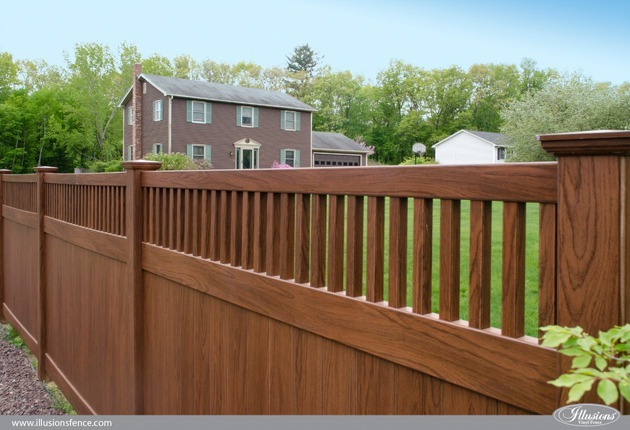 Your neighbors will be thanking you for installing this “neighbor-friendly” style of Illusions Vinyl PVC privacy fence. Both sides are equally beautiful and look exactly the same. Rosewood Vinyl Fencing. Just Plain Cool. The best ideas come from the heart. 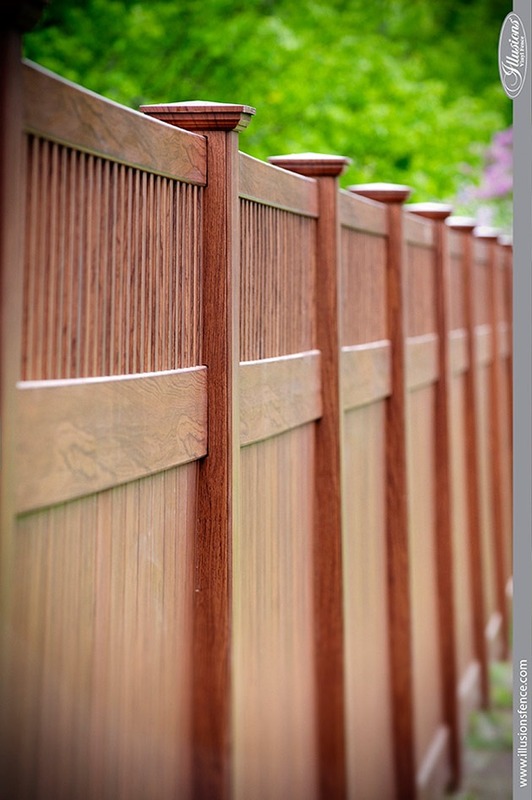 For a fence that looks like newly stained wood with the low maintenance and long life of vinyl. Grand Illusions Vinyl WoodBond answers the call.